Wow this is really cool and looks insanely useful and time saving. Looks great! Any chance it's gonna have wind etc like in your Dynamic Tree & Plant Generator? Looks awesome and time saving, great job! and i really really want this tool !!!!!! any ideas about pricing yet ? Thank you! Default ivy leaves have basic wind in material + probably I'll add some interactive material effect in the first update. But it won't be fully dynamic like Dynamic Tree & Plant Generator - trees/plants have quite predictable structure, but in case of Smart Spline Generator, there are too many possibilities to implement some optimized dynamic interaction system. Besides, it's also recommended to convert generated assets (at least the bigger, more complicated ones) into single static meshes via Merge tool to have good performance, so the only dynamic interaction I can think of would be through materials with vertex offset. About the price, I think it will be somewhere in the area of the Dynamic Tree & Plant Generator price, imho quite reasonable for the possibilities - but I'm not sure yet. 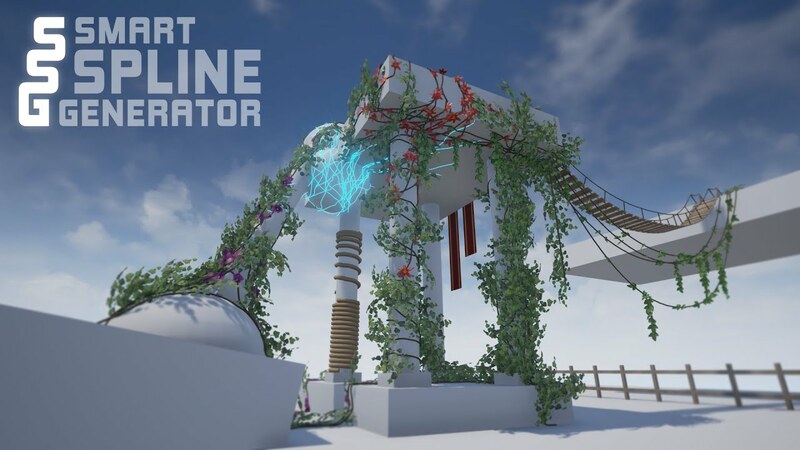 Smart Spline Generator has passed the review process and will be available on June 29th! I can't wait to try that, really nice job! wow will be very looking forward for it ! Smart Spline Generator has been released today!